AUSTRALIAN rookies Jordan Mailata and Michael Dickson are sending tremors through the NFL from opposite US coasts. 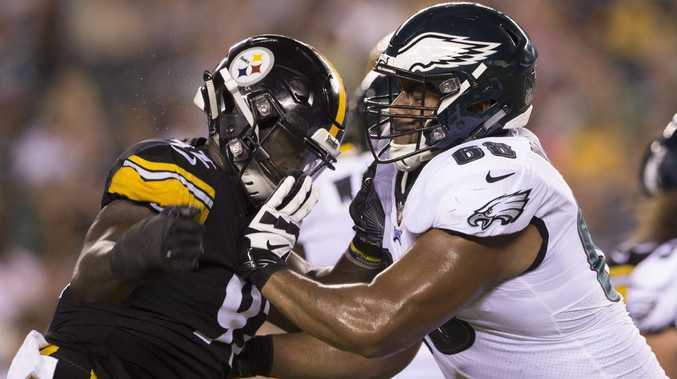 Mailata, the 203cm-tall, 158kg former South Sydney Rabbitohs NRL prospect, has made such an impact during the NFL pre-season with Super Bowl champion the Philadelphia Eagles he is expected to achieve what a week ago was considered highly unlikely. The Eagles will slash their roster from 90 to 53 on Saturday before next week's start of the regular season and Mailata is tipped to make the cut, while NFL veterans and college standouts who have been playing the game since they were little kids will not. The Philadelphia Inquirer reported on Monday that Mailata's "rapid development is forcing the Eagles to rethink" their initial plan to waive the Australian on the weekend and then sign him to their practice squad. Mailata has been so impressive, with his size and speed providing so much potential, the Eagles are unlikely to run the risk of allowing another NFL team to sign if he is initially waived. "So, expect the 21-year-old Mailata, who never played a down of football before this month, to wind up on the Eagles' season-opening, 53-man roster," the Inquirer reported. On the west coast, former Sydney Swans prospect Michael Dickson has the city of Seattle buzzing. That is also extraordinary, considering punters do not tend get NFL fans excited. "In American football, this Aussie rules," the Seattle Times told readers on Monday. A week ago 21-year-old Dickson pulled off what was considered a long shot - beating Jon Ryan, Seattle's punter for the past decade, for the Seahawks' punting job. Dickson, after a record-breaking stint at the University of Texas, has been so good in the pre-season the Seattle Times raised the prospect of fans hoping the offence, led by star quarterback Russell Wilson, would falter just so they could see the Australian punt them out of trouble. "He has turned the most mundane act in football into performance art," the Times wrote. Dickson leads the NFL in net average with 48.1 yards (44m) per punt in the pre-season but it is also what he does with ball in the air, the placement and ability to control how a pointy NFL ball will bounce. "The video-game analogy is a common one when describing otherworldly feats in sports, but I don't think you can replicate what Dickson does on Madden (the NFL video game)," the Times continued. Seahawks coaches and fans also like how Dickson is willing to draw on his Aussie rules background and get physical. In Friday's pre-season game against the Minnesota Vikings, Dickson booted the ball a hefty 61 yards (55.7m). Vikings returner Chad Beebe caught it at the 12-yard line, found open space and appeared headed for a touchdown until 191cm tall, 94kg Dickson aggressively tossed him over the sideline.